Spring is the best season to give your indoor space a makeover. When decorating and styling a room, the first things that may come to your mind are furniture or embellishments. 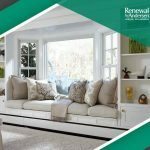 Many homeowners tend to overlook their windows when planning to improve their interior.